Background: We sought to compare the effectiveness of oxygen (O2) treatment administered by an O2 mask and nasal continuous positive airway pressure (NCPAP) in infants after congenital cardiac surgery. Methods: In this retrospective observational study, 54 infants undergoing corrective cardiac surgery were enrolled. According to the anesthesiologist's preference, the patients ventilated for more than 48 h were either put on NCPAP or O2 mask immediately after extubation. From pre-extubation to 24 h after treatment, arterial blood gas and hemodynamic data were measured. Results: After 24 h of NCPAP institution, the patients showed a significant improvement in oxygenation compared to O2 mask group. Respiratory rate (per minute) decreased from 31.67 ± 4.55 to 24.31 ± 3.69 (P < 0.0001), PO2 (mmHg) increased from 112.12 ± 22.83 to 185.74 ± 14.81 (P < 0.0001), and PCO2 (mmHg) decreased from 42.88 ± 5.01 to 37.00 ± 7.22 (P < 0.0076) in patients on NCPAP. In this group, mean pediatric cardiac surgical Intensive Care Unit (PCSICU) stay was 4.72 ± 1.60 days, with only 2 (11.11%) patients requiring re-intubation. Conclusion: NCPAP can be used safely and effectively in infants undergoing congenital cardiac surgery to improve oxygenation/ventilation. It also reduces the work of breathing, PCSICU stay, and may reduce the likelihood of re-intubation. The relaxation volume of the infant thorax is smaller than the adult, resulting in a lower functional residual capacity (around 15% of vital capacity compared to 35% in the adult). This imposes a clear disadvantage in terms of alveolar stability due to an increased tendency to collapse, especially in the sedated infant during ongoing mechanical ventilation after cardiac surgery. However, the literature reporting the efficacy of NIV therapy in infants with heart disease is scarce. Noninvasive positive airway pressure ventilation is easy to setup and wean, more comfortable, and less expensive. Technical problems such as interface and ventilator equipment, unknown effects on cardiopulmonary interaction, risk of aspiration, and effects on chest wound healing frequently limit the use of NIV for infants with heart disease. The role of NIV and use of bi-level positive airway pressure (BiPAP) nasal CPAP (NCPAP) support were previously evaluated in pediatric patients with status asthmaticus , and in pediatric patients undergoing cardiac surgery, respectively. Still it had not been specifically evaluated in infants undergoing cardiac surgery. Hence, the practice of NCPAP usage in infants is relatively low and often subjected to difference of opinion. We designed a retrospective study with an aim to compare the efficacy of O2 mask and NCPAP in infants requiring prolonged ventilation (>48 h) after cardiac surgery. This was a retrospective observational study, approved and cleared by the Institutional Ethics Committee. From January 2013 to December 2013, a total of 372 infants underwent different cardiac surgeries. From this, 54 patients required prolonged ventilation (>48 h), and out of them, 36 pediatric patients were placed on O2 mask after extubation and 18 patients were placed on NCPAP. The choice of patient for NCPAP or O2 was basically the anesthesiologist's decision. Patients with re-operation, perioperative cardiac arrest, severe organ dysfunction (renal and liver), severe neurological disease, abdominal distention, or swallowing reflex abnormality were excluded from the study. After cardiac surgery, 54 patients required invasive ventilation for more than 48 h. In this study, 36 patients after prolonged ventilation were put on O2 mask with 3–4 L/min O2 flow and 18 patients were put on NCPAP (by nasal cannula with NCPAP circuit; FANEM, Sao Paulo, Brazil). We used noninvasive NCPAP mode (GE Engstrom Carestation ventilator) in pediatric setup of ventilator, with an initial NCPAP setting for all with FiO2-50%, PEEP - 5, bias flow - 8.0 l, and trigger - 1.0. If patients did not respond to these settings, PEEP and FiO2 were increased subsequently. A backup rate was added to assist with inadequate minute ventilation or apnea. The patients were closely monitored in terms of vital signs, oxygen (O2) saturation, respiratory rate, tidal volume, breathing effort, chest retraction, use of accessory respiratory muscles, patient–ventilator synchrony, abdominal distention, aspiration, sedation for anxiety, blood gas, and chest X-ray for lung status and pneumothorax. The indications for terminating O2 mask or NCPAP included no obvious relief of dyspnea, no significant improvement of blood gas, hemodynamic instability, vomiting, and respiratory tract obstruction with secretions. Statistical analysis was performed using SPSS software, Version 20.0 (IBM Corp., Chicago, IL, USA). Categorical variables were presented as numbers and percentages and analyzed using the Chi-square test. Continuous variables were assessed for normal distribution and presented as mean and standard deviation. Continuous variables were compared using the Student's t-test for normally distributed variables and the Mann–Whitney U-test for non-normally distributed variables. The level of significance was accepted at P < 0.05. In this retrospective study, 54 infants required prolonged ventilation after cardiac surgery. Out of these, 36 patients were put up on O2 mask and 18 patients were directly put on noninvasive NCPAP. The demographic data in both groups (age, gender, surgery type, bypass time, and cross clamp time) were comparable [Table 1]. Comparison of hemodynamic parameters between pre- and post-extubation at various time intervals in both the groups is shown in [Table 2]. After 24 h of treatment, the respiratory rate decreased significantly in the NCPAP group (pre-extubation; 31.67 ± 4.55 vs. after 24 h; 24.31 ± 3.69, P < 0.05) as compared to O2 mask group (pre-extubation; 33.22 ± 3.65 vs. after 24 h; 34.49 ± 5.20), while heart rate (pre-extubation; 151.61 ± 20.13 vs. after 24 h; 140.16 ± 18.58, P = 0.0851 in NCPAP group) and (pre-extubation; 141.53 ± 20.96 vs. after 24 h; 139.67 ± 22.55, P = 0.7181 in O2 mask group), mean atrial pressure (pre-extubation; 51.82 ± 9.14 vs. after 24 h; 47.5 ± 7.87, P = 0.1379 in NCPAP group and pre-extubation; 51.77 ± 10.87 vs. after 24 h; 48.80 ± 9.92, P = 0.2300 in O2 mask group), central venous pressure rate (pre-extubation; 7.61 ± 3.94 vs. after 24 h; 9.83 ± 2.97, P = 0.0647 in NCPAP group and pre-extubation; 7.78 ± 2.59 vs. after 24 h; 7.96 ± 3.32, P = 0.7983 in O2 mask group) were comparable [Table 2]. The improvement in both the groups was further compared according to their arterial blood gas parameters and the data are shown in [Table 3]. There was significant improvement in PO2 after 24 h in the NCPAP group (pre-extubation; 112.12 ± 22.83 vs. after 24 h; 185.74 ± 14.81, P < 0.0001) compared to the O2 mask group (pre-extubation; 110.38 ± 34.14 vs. after 24 h; 135.18 ± 46.85, P < 0.05). PCO2 was significantly decreased in NCPAP group after 24 h (pre-extubation; 42.88 ± 5.01 vs. after 24 h; 37.00 ± 7.22, P < 0.05) as compared to O2 mask group (pre-extubation; 41.83 ± 6.02 vs. after 24 h; 40.23 ± 9.74). pH in NCPAP group after 24 h (pre-extubation; 7.34 ± 0.14 vs. after 24 h; 7.43 ± 0.65) was comparable to O2 mask group (pre-extubation; 7.32 ± 0.13 vs. after 24 h; 7.45 ± 0.06). In this study, the number of patients requiring re-intubation was significantly (P = 0.049) lower in NCPAP group (11.11%) as compared O2 mask group (41.67%) [Table 4]. 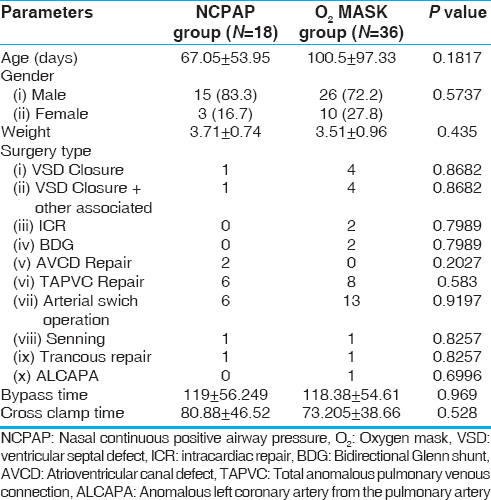 Pediatric cardiac surgical ICU stay in NCPAP group (4.72 ± 1.60) was less compared to O2 mask group (7.11 ± 1.19, P < 0.0001), which is highly significant. Mortality was comparable in both the groups (P = 0.868). In children, complex congenital heart surgery performed with cardiopulmonary bypass may be associated with pulmonary edema, pneumonia, bleeding, and atelectasis, during the postoperative period. Such patients may require prolonged ventilation (more than >48 h) and develop respiratory insufficiency after extubation. In our study, we have retrospectively compared the outcome of O2 mask and NCPAP in infants undergoing complex congenital heart surgery. Clinical response was associated with improvement of patients' clinical condition and arterial blood gas. NCPAP is useful in improving the management of ARF in children.,, Noninvasive positive pressure ventilation is superior to standard therapy in preventing intubation and reducing mortality. NCPAP ventilation for the delivery of inspiratory pressure has been shown to reduce the work of breathing. The flow-triggered NCPAP system can decrease expiratory work of breathing and improve patient comfort. The NCPAP ventilator support system offers a backup ventilator mode for machine breath in the event of apnea. We have observed that NCPAP was most effective in patients with prolonged ventilation and respiratory muscle fatigue. We routinely extubated the patients after cardiac surgery as early as possible, if they were hemodynamically stable only. Otherwise, prolonged mechanical ventilation was used for the patients with severe underlying disease. This was a retrospective analysis of records. Patients were not randomized and therefore, there are several potential sources of bias in allocation to NCPAP versus O2 mask. We acknowledge this limitation. The true incremental value of NCPAP can only be determined through a randomized controlled trial. The data from this study can help design a large prospective randomized controlled trial. We conclude that NCPAP is useful in improving the ventilation and preventing ARF in infants after cardiac surgery. This technologically simple, noninvasive, cheap, and safe way to provide respiratory support is suitable after prolonged ventilation in developing countries, where facilities for pediatric intensive care and ventilatory support are inadequate. Cooper DS, Jacobs JP, Chai PJ, Jaggers J, Barach P, Beekman RH, et al. Pulmonary complications associated with the treatment of patients with congenital cardiac disease: Consensus definitions from the Multi-Societal Database Committee for Pediatric and Congenital Heart Disease. Cardiol Young 2008;18:215-1. Rimensberger PC, Heulitt MJ, Meliones J, Pons M, Bronicki RA. Mechanical ventilation in the pediatric cardiac intensive care unit: The essentials. World J Pediatr Congenit Heart Surg 2011;2:609-19. Boros SJ, Bing DR, Mammel MC, Hagen E, Gordon MJ. Using conventional infant ventilators at unconventional rates. Pediatrics 1984;74:487-92. Tan L, Zhu X, Zhang Z. Study on postoperative ventilation-associated pneumonia and its risk factors in children with congenital heart disease. Chin J Thorac Cardiovasc Surg 2001;6:337-9. Fortenberry JD, Del Toro J, Jefferson LS, Evey L, Haase D. Management of pediatric acute hypoxemic respiratory insufficiency with bilevel positive pressure (BiPAP) nasal mask ventilation. Chest 1995;108:1059-64. Akingbola O, Servant G, Custer J, Palmisano J. Noninvasive bi-level positive pressure ventilation: Management of two pediatric patients. Respir Care 1993;38:1092-8. Teague W, Lowe E, Dominick J, Lang D. Non-invasive positive pressure ventilation (NPPV) in critically ill children with status asthmaticus. Am J Respir Crit Care Med 1998;157:542. Zhang CY, Tan LH, Shi SS, He XJ, Hu L, Zhu LX, et al. Noninvasive ventilation via bilevel positive airway pressure support in pediatric patients after cardiac surgery. World J Pediatr 2006;2:297-2. Tobin MJ. Respiratory monitoring during mechanical ventilation. Crit Care Clin 1990;6:679-709. Cam BV, Tuan DT, Fonsmark L, Poulsen A, Tien NM, Tuan HM, et al. Randomized comparison of oxygen mask treatment vs. nasal continuous positive airway pressure in dengue shock syndrome with acute respiratory failure. J Trop Pediatr 2002;48:335-9. Chadda K, Annane D, Hart N, Gajdos P, Raphaël JC, Lofaso F. Cardiac and respiratory effects of continuous positive airway pressure and noninvasive ventilation in acute cardiac pulmonary edema. Crit Care Med 2002;30:2457-61. Girault C, Daudenthun I, Chevron V, Tamion F, Leroy J, Bonmarchand G. Noninvasive ventilation as a systematic extubation and weaning technique in acute-on-chronic respiratory failure: A prospective, randomized controlled study. Am J Respir Crit Care Med 1999;160:86-92. Tan L, Li J, Zhu X, Zhang Z, He X, Zhang C. Children with congenital heart disease for a long time after the application of mechanical ventilation. Chin J Emerg Med 2002;11:349-0.